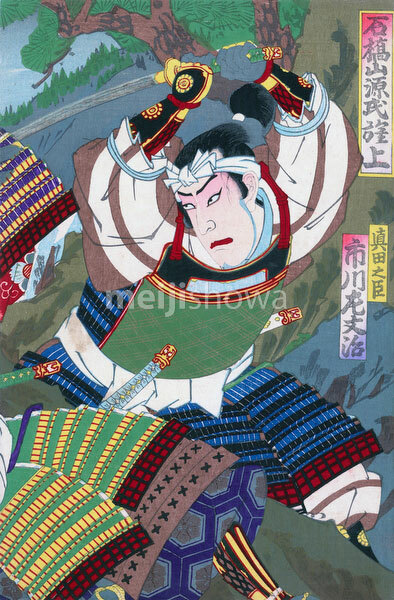 Ukiyoe woodblock print of samurai in battle. This is one part of a triptych (80222-0004.1) by Utagawa Kunisada III (歌川国貞, 1848–1920), titled Genji Samurai Warriors on Mt. Ishibashi (石橋山源氏旗揚), published in 1893 (Meiji 26). The Battle of Ishibashiyama (石橋山の戦い, Ishibashiyama no Tatakai) was fought on September 14, 1180 near Odawara (小田原市), Kanagawa Prefecture (神奈川県). The three images in this triptych: 80222-0004, 80222-0006, 80222-0005 (this one).